The Safe Schools/Healthy Students (SS/HS) Framework tool helps you and your partners understand and plan a comprehensive approach to mental health promotion and youth violence prevention and was developed from evaluation data and working with SS/HS grantees across the country since 1999. The SS/HS Framework integrates the five SS/HS Elements with Strategic Approaches and Guiding Principles. The SS/HS Elements are the core components of the SS/HS Initiative while the Strategic Approaches are the roadmap to ensure success in planning and implementation in how education, mental health, and child and family serving agencies work together at the State and community level. 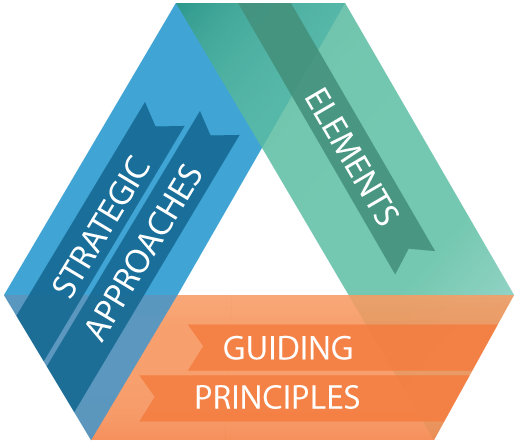 The Guiding Principles are the values that connect content and program areas of the Framework. You can use this interactive tool at the state or community level to develop a comprehensive plan to meet your unique needs in mental health promotion and youth violence prevention.